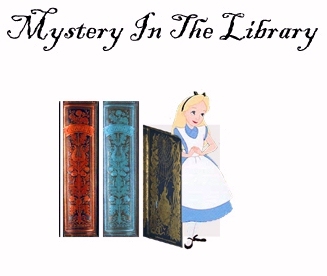 A mystery that’s perfect as a library game or as fun for anyone! The characters come out of their books at night to frolic. His Majesty King Henry VIII – has disappeared. Who rid the library of Henry? The school versions come with teacher’s notes. The other night in the library, when many characters were out of their books enjoying a sojourn in the night air, a crime was committed, grim and grave, right in our own library. As a result his Majesty Henry VIII – that famous monarch from the English history books – has disappeared. Gathered at this table are the characters who were present in the library at the time of the nasty deed. Fortunately Master Sherlock Holmes is here to investigate, so the perpetrator of this heinous crime will no doubt be revealed as the night proceeds. “Hi Stephanie! Remember me? I purchased the script for 50 for our teacher appreciation dinner. We held the event on Friday night and I cannot tell you what a huge success it turned out to be. We spent three long evenings decorating for this event and when you walked in to the room you really thought you had walked in to an old English library. We had wonderful scenes of Sherlock Holmes and Alice with the Queen of Hearts on the wall. We are fortunate to have several artists on staff. 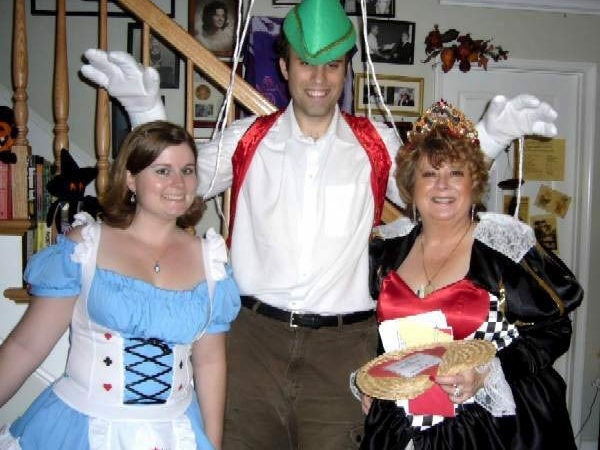 The teachers gave … with their costume, most going out and renting very elaborate outfits. The script was wonderfully written, my staff ad-libbed beautifully. We laughed for 4 hours straight. What a wonderful evening we had. The classified staff dressed as English maids and butlers in black and white and we served grilled steak or chicken, serving approximately 110 people. It was a night to remember and I am hearing the same sentiments from the entire staff. They are wanting a repeat for next year! Whew! It was a tremendous amount of work but it all paid off. Thank you for helping to make this evening so very special! Tina McIntosh , Red Gum Cottage, Tamworth, NSW, Australia. “We had a fantastic time with our 8th grade middleschoolers. It was a bonding and team building time and this wonderful game brought incredible memories and fantastic anticipation for more of these mystery games to come. I had college kids help with cooking and decorations and now they’re asking when it’s their turn to play. Thank you for an unforgettable evening!!! The kids and parents still talk about that “magical” evening! See photo No. 1 above for Peter Pan and Tinkerbell posing for a photo. See photo No. 4 for a group photo. “I hosted a surprise 16th birthday party for my son. 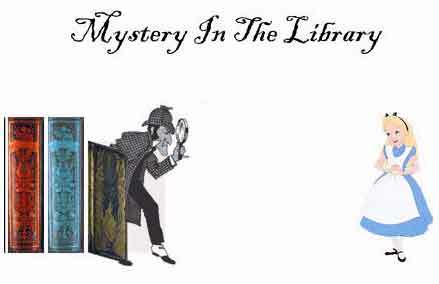 The theme was Mystery in the Library. The youngest was 1 and the oldest was 85. We had so much fun! 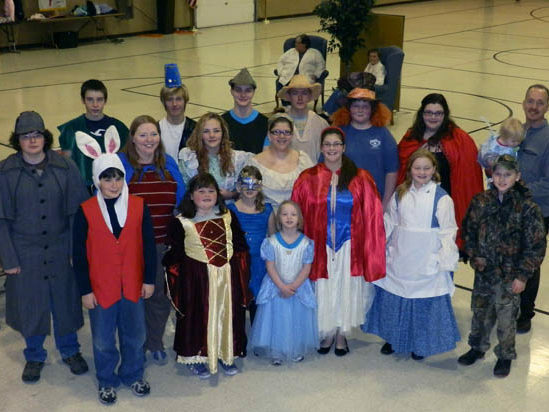 The play was great and allowed everyone to participate. I decorated with books from the mystery and also my son’s favorite books. He is an avid reader and loved all the costumes and books! We had a great evening and would recommend this mystery to anyone wanting to entertain a wide range of ages. Thanks so much! I am entering the decor contest. Here are Melissa’s winning decoration photos (see photo No. 5, 6 above). “It was fabulous!!! 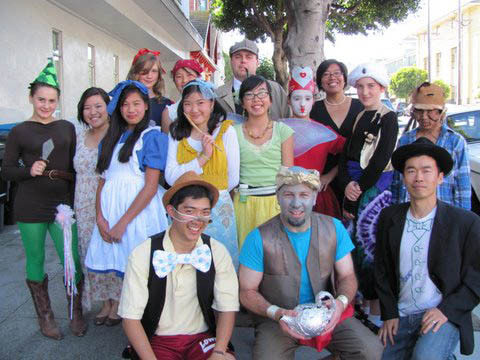 Whoever thought that a bunch of grownups could have so much fun dressing up as mostly storybook characters? Since everyone was given a character assignment, they spent their time simply working on their character and not wasting time trying to figure out what to be. Definitely a plus. Our party was held Saturday, Nov. 1, 2008. The weather for the weeks before was beautiful, but for party night it was a downpour of much-needed rain. That meant that all the vignets we had planned to decorate around which were to be outside had to come inside. Last minute decorating! What we did was make up 10 vignets to honor the 10 suspects. We had a ton of fun just planning what it would look like. It was interesting to watch the evening unfold. At first people weren’t sure what to do, but as they started chatting and reading their clues, they definitely got into the swing of things. One group of about 10 were found sitting in the family room, and they were discussing in a quite serious manner, about whether Aladdin was at such-and-such a place, and could he have done it! What a hoot. No politics. Just real sleuthing and concern for Henry VIII. When we gathered back in the library/living room by the fireplace, we went around the room and each character explained who they thought did the deed and why. It was amazing how high-powered executives could spend their time solving this “crime”! Everyone had a blast and said it was probably the best party they had ever been to. Better yet, we have to come up with another one for next year!!! So, thank you so much, and please, oh please, have the perfect party idea, again, for my group of 35-40 people. 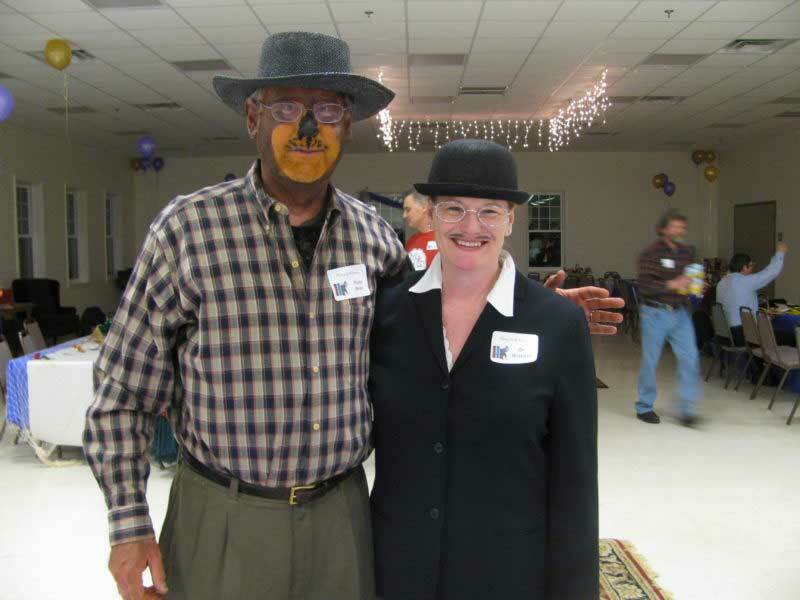 “We had a wonderful time decorating and putting on this mystery dinner! Our youth group has successfully used the mystery dinner for two years now, as a fundraiser to pay for our mission trip this summer. 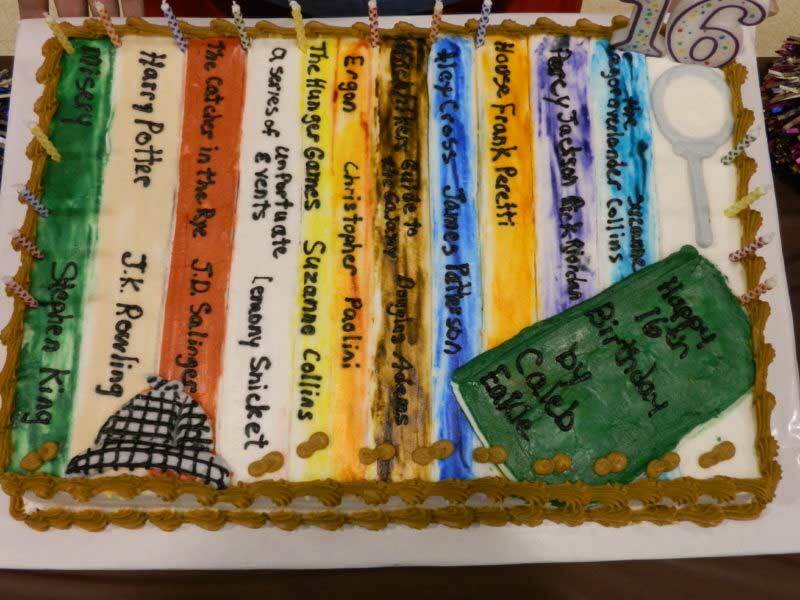 I have a number of wonderful pictures, especially one of the cake that our talented rector’s wife created for this event! 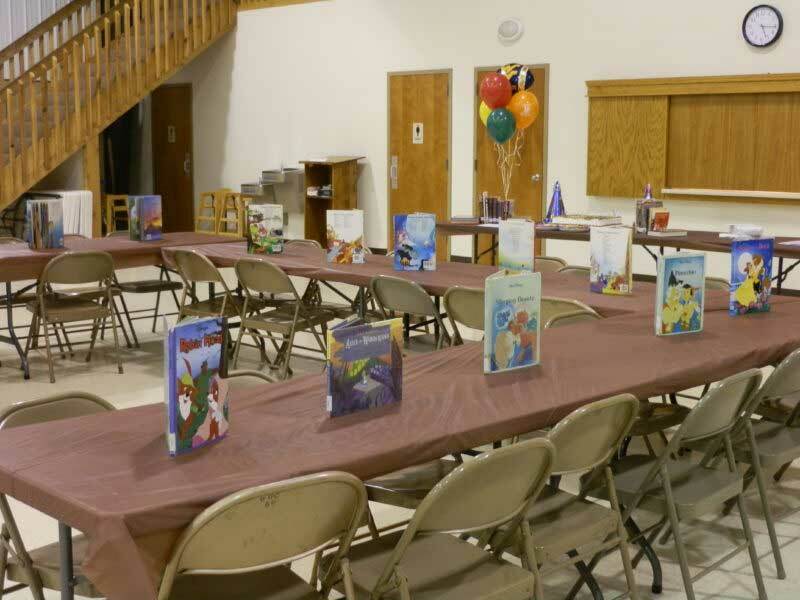 But I can only attach one, and was so proud of our youth for coming up with the idea of themed tables and creating runners for each table with drawings of different stories (they used many Disney stories and fairy tales). The attached Little Mermaid theme was one of my favorites! My name is Tara Hendrickson. I purchased your Mystery in the Library kit and we just had the party today! The party was a huge success! I had 23 people participate, including myself. 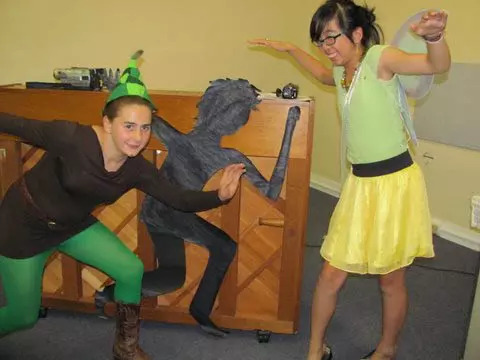 The costumes were so creative. The acting was amazing. People really got into their characters…sometimes to their detriment because they were making up information before they had heard all of the clues! It was great to see the dedication though. I didn’t actually play the game, but was there as Sherlock Holmes to help make sure it flowed smoothly. I loved hearing everyone come up with theories about the King and whisper to each other behind other characters’ backs. For decor I made 10 hand-drawn pictures of storybooks with the suspects missing from the pages and hung signs from the ceiling with Dewey Decimal sections of the library listed. With a bunch of books strewn throughout the house, it really made you feel like you were in a library! I have attached a few photos for you of the costumes and the decor. Thank you so much for a great time had by all. I look forward to future parties with you! Note: The reading levels of each kit (not just “page” as it says below) were determined by copying and pasting the kit (the play version), into The Readability Test Tool (see www.read-able.com). This is just the average reading level. See the character page for the reading levels for each suspect character’s lines. The characters vary from kit to kit. If Sherlock Holmes is present, his Reading Level is 7.